This year they wanted me to make Hershey Pull Treats! Easy peasy and since I don't have to make too many, Mom is happy, too! For the teachers I am also including a card! My daughter, Lauren, loves the new Witch stamps from Taylored Expressions, so that is what I used here! Here is a close up of the card! I stamped the witch shoes (LOVE!) from Spooky Expressions in Memento Tuxedo Black on Choice Snow White, colored it in with Copic Markers, and cut out with Circle and Scallop Circle Nestabilities. 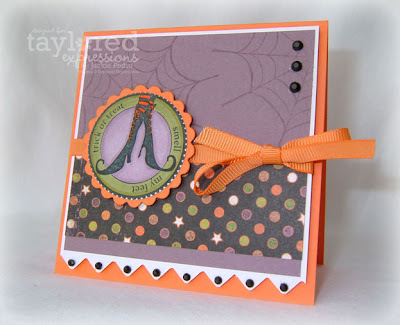 The web stamp is also from Spooky Expressions and was stamped in Versamark on Wizard Medium. The patterned paper is Basic Grey Eerie. 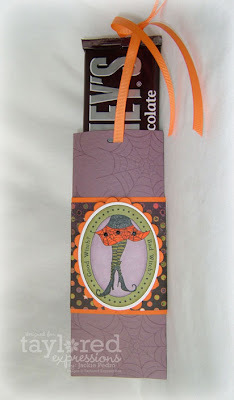 All of the cardstock and patterned paper comes from the Halloween Key Ingredients Kit. The black adhesive gems and ribbon are from my stash. For the pull treat, I used the witch legs from Punchy Potions. It was stamped on Choice Snow White with Memento Tuxedo Black and colored in with Copic markers. I love that these stamps were made to fit in the Classic Large Oval Nestabilities! I used the same cardstock and patterned paper as on the card above! You can find directions for these easy and cute pull treats here! I'll be making a few more of these this Halloween season! Did you know that Taylored Expressions has a monthly newsletter? It's how I kept up on everything TE before I became a part of the Baker's Dozen Design Team!! It's so easy to sign up! Just head on over to the Taylored Expressions Website and enter your email address under the "join our mailing list" icon and that's it!! You will be informed of any new releases and all of the new "fresh from the oven" products in the store!! These are AWESOME Jacks! LOVE LOVE LOVE your coloring and the pull treat is totally fabu!!! Oh so cute--great colors, witch image, and webs!